Dr. Street passed away peacefully on 28 December, 2016. She was privately cremated onThursday5 January, 2017. Anne was a Founding Fellow of the Institute for Combinatorics and its Applications, and an editor of the BICA from 1991 to 2014. 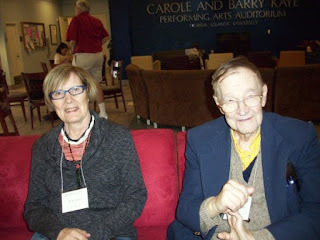 Picture of Anne Street and Ralph Stanton from Boca conference in 2009. Anne was a student of Michio Suzuki and received her PhD at University of Illinois at Urbana-Champaign in 1966 with dissertation "Subgroups Determining Functions on Groups."